Nothing says good morning like the smell of freshly baked muffins. And it's even better when you get more of the top. After all, who doesn't love eating the top of the muffin only? 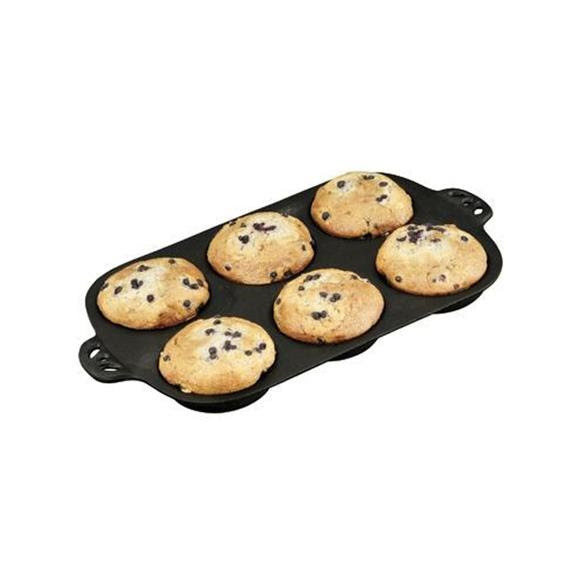 With Camp Chef's Cast Iron Muffin Toppers Biscuit Pan you don't have to throw away the bottom of the muffin ever again. The cast iron promotes even heat distribution leaving the perfect golden brown muffins every time. Nothing says good morning like the smell of freshly baked muffins. And it&apos;s even better when you get more of the top. After all, who doesn&apos;t love eating the top of the muffin only? With Camp Chef &apos;s Cast Iron Muffin Toppers Biscuit Pan you don&apos;t have to throw away the bottom of the muffin ever again. The cast iron promotes even heat distribution leaving the perfect golden brown muffins every time. Dimensions (packed) 9" x 16"